Dublin’s RDS came alive this weekend as the 30th European Union Contest for Young Scientists opens its doors to the public. 134 students from 38 countries will this weekend compete for the coveted title of European Union Young Scientist of the Year 2018. 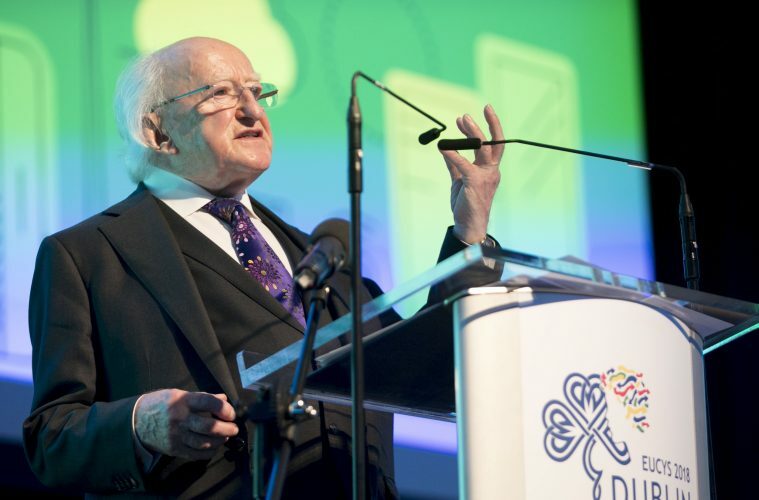 A great supporter of and frequent visitor to the Irish national qualifying competition, the BT Young Scientist & Technology Exhibition (BTYSTE), President of Ireland, Michael D. Higgins officially welcomed student STEM leaders from across the globe to the RDS today. Highlighting the variety and high quality of the projects undertaken by the students, and the spirit of innovation and creativity from which they originated, President Higgins spoke of the important contributions made by science and highlighted the need to strengthen the connections between scientific endeavour and societal, environmental and ethical considerations. An initiative of the European Commission under the Science and Society programme, EUCYS is the annual showcase of the best of European student scientific achievement. There will be 88 projects on display in the RDS covering a wide range of topics; from the representation of gangsterism and scientific progress in comic books (Luxembourg) to a smart weather system simulator (Tunisia). All EUCYS participants have previously won first prize in their home country’s national science competition, the equivalent to the BTYSTE in Ireland. Their projects cover a broad spectrum of scientific areas, including biology, physics, chemistry, computing, social sciences, environment, mathematics, materials, engineering and medicine. Simon Meehan, who was awarded the BT Young Scientist & Technologist of the Year title in January, will represent Ireland at the EUCYS. Judging at the EUCYS takes place over five stages over the course of the Contest and the judging panel is headed by Ireland’s own Prof. Tony Fagan. The first place winners of EUCYS will be awarded €7,000, with other prizes including a trip to CERN in Switzerland and the European Space Agency. The European Union Young Scientist for 2018 will be announced on Tuesday, 18 September at the Awards Ceremony in the Printworks, Dublin Castle. Ireland’s National Organiser, Mari Cahalane, said “We are thrilled to host the EU Contest for Young Scientists here in Dublin. The participants have worked so hard on their projects, and their drive and initiative is truly inspiring. EUCYS gives them a platform to share their findings with their contemporaries and the wider public here at the RDS. Ireland has traditionally performed well at the EUCYS having taken home one of the top prizes an astounding 14 times in 28 years. To mark the 30th EUCYS and the history of the BTYSTE, Ireland’s past winners, including the very first winner of BTYSTE in 1965, John Monahan, have returned to the RDS to support Ireland’s current entry and to celebrate their collective journeys since their participation. The contest will be open to the public in the RDS from Saturday 15th September to Monday 17th September, and visitors can see for themselves the fantastic projects on display. They will also be able to take in performances from the special acts line-up including SFI’s Science Zone featuring workshops from across the science realm; psychologist James Soper and his “Your beautiful biased brain” show; and Sue McGrath aka “Scientific Sue”, who will bring spectators on a journey of science and inspiration and introduce people to her fire-breathing dragons.